Panos London’s Tim Williams and Anna Egan formed our component of the Climate Change Media Partnership, a four-year project that is run in partnership with the International Institute for Environment and Development (IIED) and Internews. Our role was to mentor 20 journalists from Africa, Asia and the Americas in covering the 17th annual UN climate change conference – or CoP17 – from November 28th to 9th December 2011. 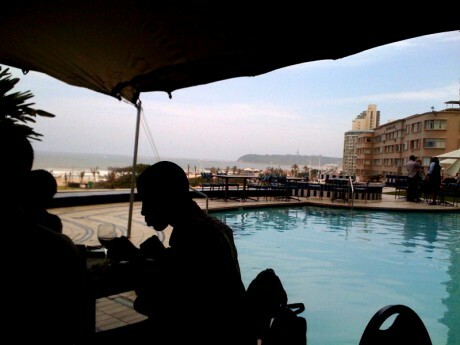 This year it was held in Durban, South Africa. These photos take you through a day of working at the CoP from the morning breakfast meetings with the journalists, planning the news and features of the day, through to the trip into the conference centre where the negotiations are held, scenes from the press newsroom, and out again to some of the parallel side events in the evening, such as the opening of the Hive in the Botanical garden and the public activities on North Beach.